Home > Resources > Recover Samsung > How to Recover Lost Data from Samsung SIM Card? SIM card is an important and essential component of your Samsung memory because generally it stores all contacts and text messages it it. Nowadays, many people ask how to retrieve deleted and lost contacts/text messages from Samsung SIM card without any backup. Well, there may be a lot of data recovery software available to recover data from Samsung devices. But you must find that those software can only recover lost files from Samsung SD card. To the contacts and text messages in SIM card, they are helpless! That doesn't mean we can't get back lost contacts and text messages from SIM card in a Samsung phone like Samsung Galaxy S6/S5/S4/S3/Note 4/3/2, as long as you find a right tool like Coolmuster Lab.Fone for Android. 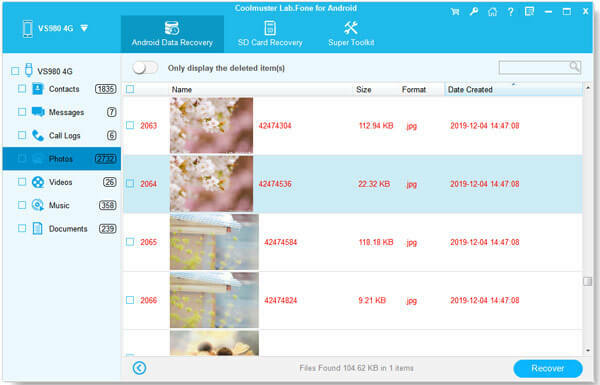 As the world's best and allaround Android data recovery software, it allows you to directly recover lost, deleted, formatted and corrupted contacts, SMS messages from your Samsung device, no matter they are in the SIM card or internal memory card. 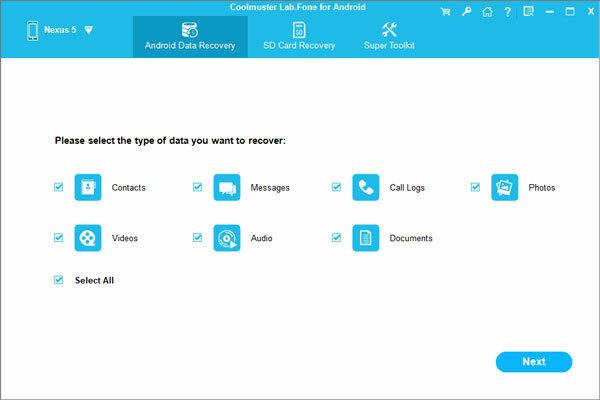 Before you start the recovery, you can preview the lost data beforehand. When you run the Lab.Fone for Android on your computer, you will see the primary window as follows. Just connect your Samsung mobile phone with the same computer via a USB cable. 3) For Android 4.2 or newer: Enter "Settings" < Click "About Phone" < Tap "Build number" for several times until getting a note "You are under developer mode" Then you may back to "Settings" < Click "Developer options" < Check "USB debugging". The Samsung data recovery tool will scan your Samsung phone automatically and show all files in categories like Contacts, Message, Photo, Videos, etc. Just preview and check those files you want back and give a click on the "Recover" button to save them on your computer.